So Aussie pub meals are pretty much a staple in an Aussie diet here. 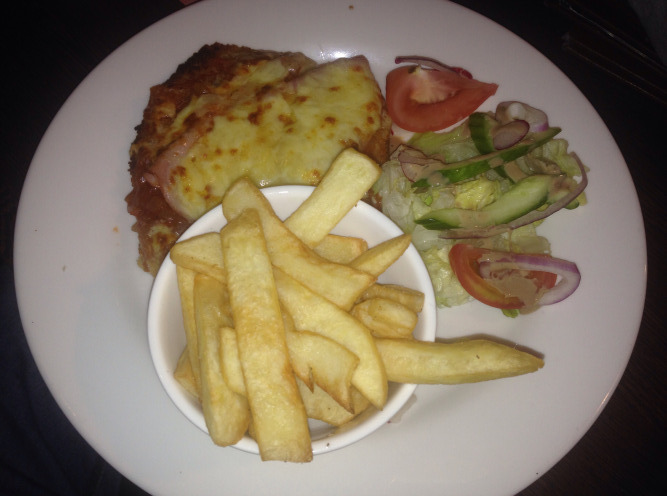 The chicken parmigiana, otherwise known as the chicken parma is an institution meal at a pub. For those of you unfamiliar with what a parma is, it is basically a breaded schnitzel, with a tomato paste sauce, a thin slice of ham and cheese melted on top. When one frequents a pub in Australia, and has a ‘counter meal’ they are usually talking about a meal that looks just like what is in this photo: a chicken schnitzel, chips and a salad. When someone travels to this part of the world, a chicken parma is definitely in order. So, the next time you visit make sure you have one, just like us locals do. It’s a pretty filling meal to have…and always delicious!